The first two of 12 U.S. Air Force fifth-generation stealth multirole Joint Strike Fighter F-35A Lightning II— the aircraft’s conventional takeoff and landing variant—arrived at Kadena Air Base, Okinawa for a six-month rotation. The F-35As will be joined by approximately 300 airmen from Hill Air Force Base in Utah. The deployment occurs amid rising tensions on the Korean Peninsula. 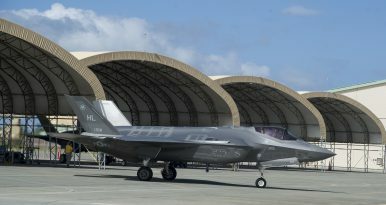 “With a very complex security environment, including [the situation with] North Korea, [the deployment of F-35A fighters] indicates that the U.S. side is showing a certain extent of commitment to this region,” Japanese Defense Minister Itsunori Onodera told reporters on October 27, according to Stars and Stripes. This is not the first time that a U.S. F-35 unit has deployed to Japan. A U.S. Marine Corps F-35B squadron, the service’s variant of the F-35 capable of vertical or short takeoffs and vertical landings without requiring a catapult launcher, has been stationed at an airbase in Iwakuni in Yamaguchi Prefecture since January. The U.S. Marine Corps Fighter Attack Squadron 121 currently consists of 16 F-35B aircraft.